In the race to win over ravenous hipsters and foodies, a number of new horses have joined the field. Thoroughbred is no exception. By reading the name you would expect telewagering, mechanical bulls or country-inspired karoke. Instead, you get a trendy, multi-floored work in progress. Floor one is an attractive smaller area housing a bar and a few tables and serving food which can be described as bar food done differently . The second floor is the kitchen complete with a 10 seat chef’s table. Only a few steps up is the third floor which will be a 35 seat dining room with a complete dinner service. Closed Sundays and Mondays, it offers lunch, dinner and late night service Tuesday to Friday and opens Saturday at 5pm. Although tempted to relish a mint julep in honour of the thoroughbreds of the Kentucky Derby, I was intrigued by pop-culture inspired Art Vandelay instead ($13). Made of London dry gin, Dr. Van Nostrand’s tonic, sage, hopped grapefruit bitters, lime and egg white, I presume it’s a spin on a Gin and tonic or even a Tom Collins developed by a guy who spent Thursday night’s in the 90’s in a spirit-induced coma laughing at the Soup Nazi, Puddy or shaking his hands at neighbours and muttering Newman under his breath. It was sweeter and smoother than I expected, perhaps a reflection of who Art actually would be compared to creator George Costanza. 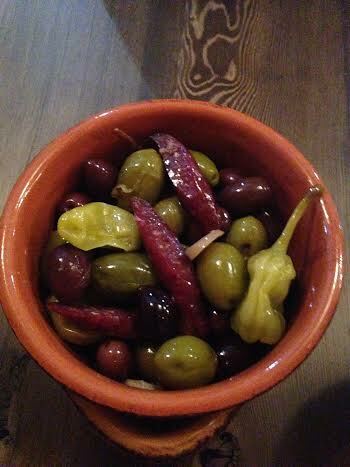 The race started with a simple bowl of olives ($6). Although it’s hard to imagine a twist one one of the most ubiquitous dishes on Toronto menus, the addition of slim jims and peperoncini peppers was a noble effort. The portion size was generous and and despite the fact I’m not an olive fan,the additions were smart and they were very acceptable. The next leg was with a bloomin’ scallion, a daintierz twist on the Outback bloomin’ onion. Light batter surrounded tender whole green onions and served atop a citrusy “dipping” sauce. 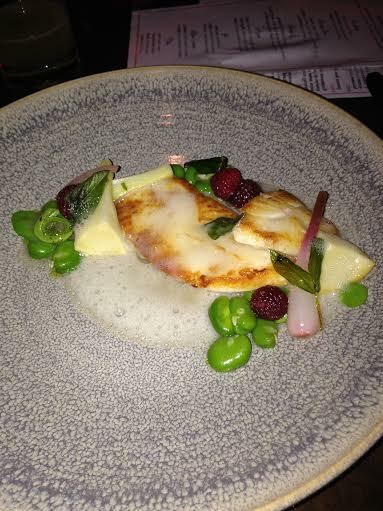 Although a plain dish, it was attractive and well executed. It’s more of a knife and fork nourishment as opposed to a get your hands greasy goody. Coming into the final turn, I ordered the roast broccoli marrow, broccoli carpaccio, plum vinegar and mache ($6). 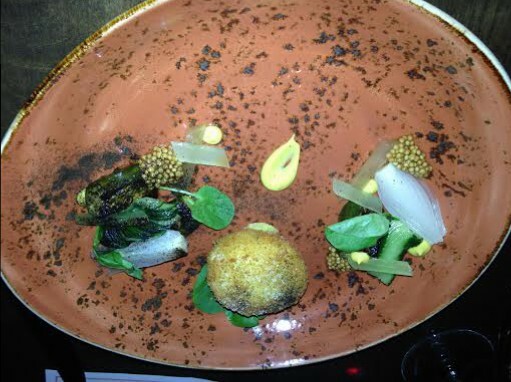 Perhaps a shot at the bone marrow movement, this dish was visually stunning and textually complex. At first sight, the roasted broccoli stalks would fool a PETA member. 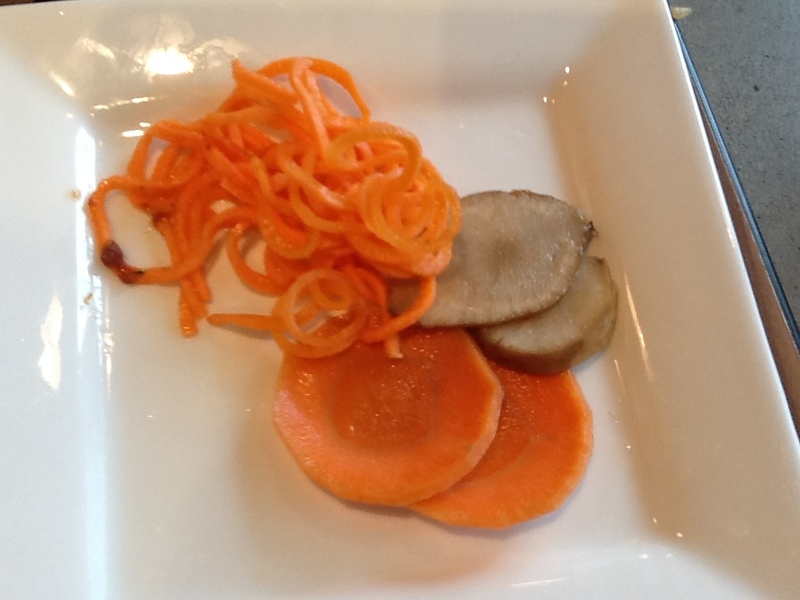 Surrounded by jicama, red pepper and cashews, the flavour was as balanced as the presentation. 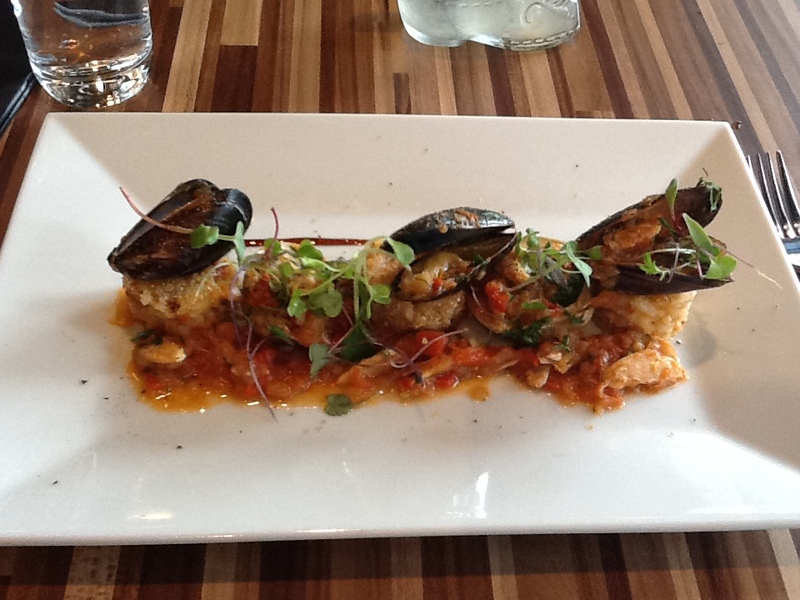 Although primarily vegetables, this dish was a steal for the price and absolutely delicious. 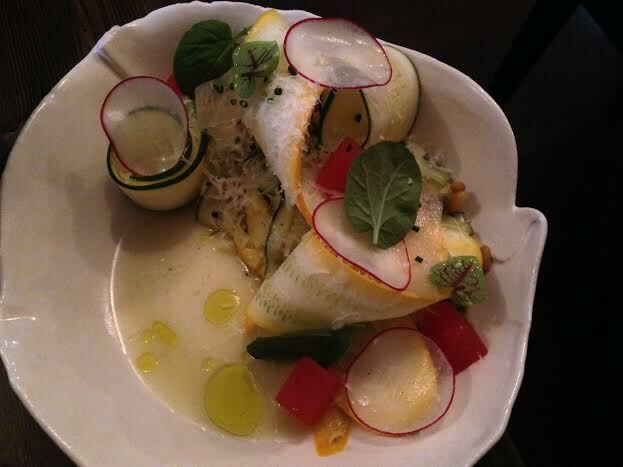 The home stretch was another vegetable creation; shaved summer squash with watermelon, pine nuts, lemon vin and grana padano ($6). Another show horse, piles of shaved zucchini were garnished with ribbons of the same and a few radishes. The watermelon’s sweet and the cheese’s salt sung a harmonious tone atop the tart lemon vinaigrette and spots of olive oil. 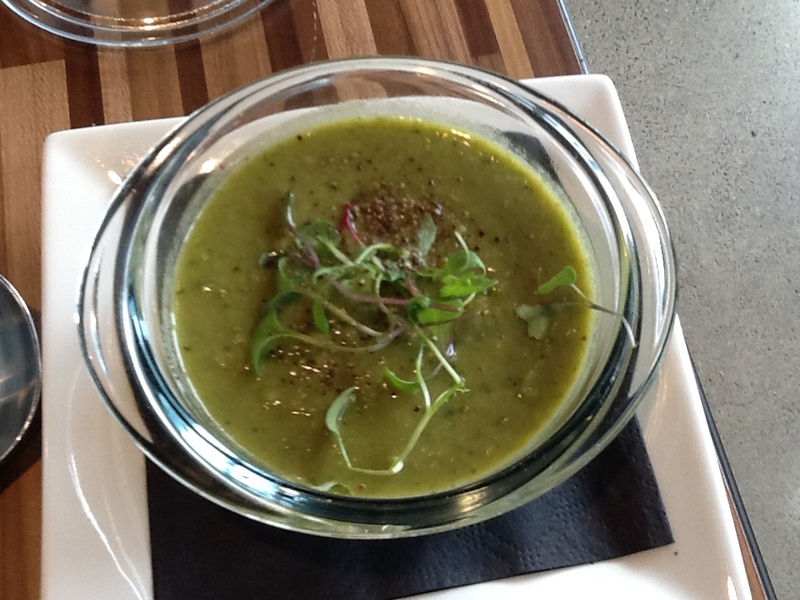 Like the broccoli, it was a light, well constructed, striking and balanced dish. Not only is the food delicious, but the service was top notch. Lacking a Kentucky Derby pretension, professional staff run the place, including an engaged business partner who is cordial and visible. He introduced himself to me and brought me upstairs to meet the head chef and show me the kitchen, chef’s table and future dining area. The chef table’s concept includes unique group offerings including a Flintstone’s (ribs and all the fixings) or east coast seafood theme. Patrons can also set price points and let the chef go wild. The menu is in progress but promises a full dinner menu reminiscent of the offerings in the bar below. Thoroughbred has come out of the gates offering a cool, trendy yet slight awkward set up close to the entertainment district. So far, the food and service are winning heats. They ignore the expected equine cliches by naming cocktails after Axel Foley instead of Willie Shoemaker. Excellent service and engaged ownership combined with unique and innovative snacks, sinful meats, seafood and sandwiches make up the bar menu which leads me craving the bigger show upstairs once it’s offered. If using the metaphor of a horse race, so far Throughbred is a winner. In the Toronto restaurant derby, the biggest question is whether their vision will come to fruition and this foal will achieve the success of Secretariat or the unfortunate fate of Barbaro. If they stick to this gameplan, I’ll place my bets on the former. 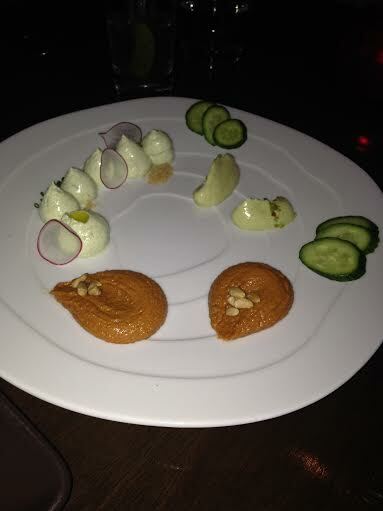 I took a long cab ride into the Richmond district of San Francisco to have dinner at the Michelin star rated Aziza. It has an unassuming storefront and after you open the curtain inside the front door and enter the restaurant, you are transformed into a Moroccan casbah with a variety of tables and booths scattered throughout. I was there with a large group and they were kind enough to wave the need for a set menu since it was later and night and the kitchen could accommodate. Another thing I was impressed with was the huge cocktail list. Almost two dozen libations were on the menu, each highlighting a fruit, vegetable or herb. 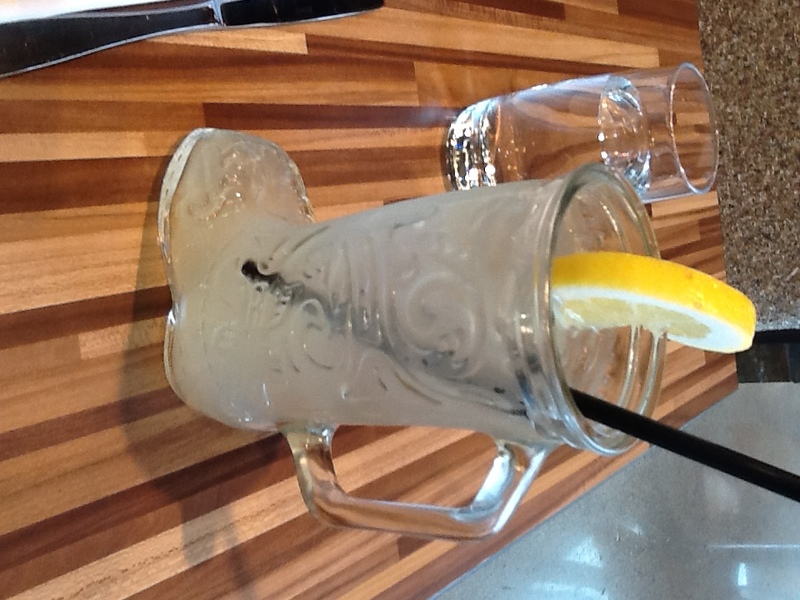 It was more difficult choosing my drink that it was my meal. Throughout the night I had three; grapefruit (absinthe, peychaud’s, bourbon), thyme (thyme, cayenne, dry vermouth, blanco tequila) and celery (sage, agave nectar, gin). I can’t say I had a favorite but they were all among some of the better drinks I’ve had this year. They were frightfully addictive and beautifully represented their respective eponym. 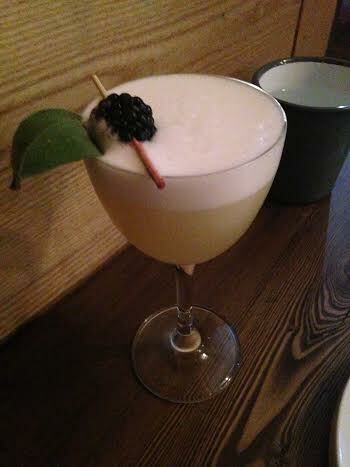 My colleague ordered the concord grape (concord grape, elderflower, peat smoke, laphroaig scotch). I had a sip and it was memorable, complex and aggressive version of the equally assertive grape. Unlike other places (including most Michelin star restaurants), the menu is not written in hieroglyphics, Gaelic or some other language that gives food critics erections. I will admit, my ego makes me a little reluctant to ask for clarification around a dish or try and pronounce something which would make my transient menu dyslexia apparent. 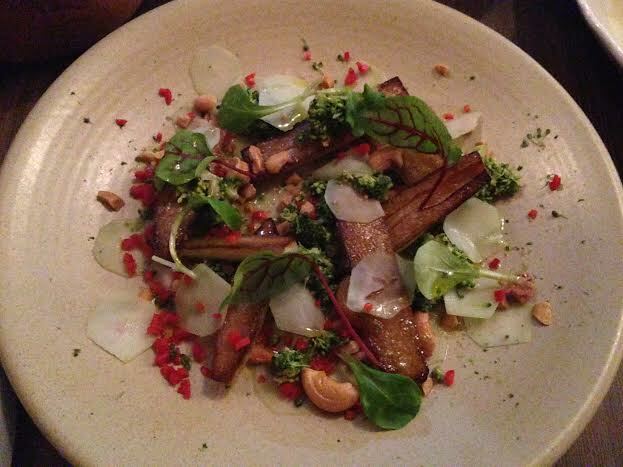 Instead, Aziza uses terms like olive, short rib, beet and sturgeon to describe their dishes. Having said this, there is no compromise on the creativity of their fare. Take the amuse bouche for example. A trio of dip including hummus, yogurt-dill and piquillo almond were served with flatbread. The dish managed to hit the mouth with some authentic Moroccan flavours while teasing the tongue with hints of Greece and Spain. For an appetizer, I ordered a dish which was simply called cucumber. It had all the components of deconstructed deviled egg. A soft yolked fried duck egg was served with was cucumber two ways; charred and carpaccio style. Spring onions and vadouvan (similar to masala) mustard completed the dish. I must say this is the first time I’ve had charred cucumber and I was surprisingly impressed. As a whole,the dish was a punchy interpretation of the picnic favorite and at $14, I thought it might have been the coveted golden egg. I was pleased to see that the market fish of the evening was John Dory (not to be mistaken with John Tory who may be the man who will finally oust the large and in charge, arrogant, homophobic and obnoxious Rob Ford from the Mayor’s office in October). It’s not the prettiest fish, but it sure is tasty and there are many suggestions of the origin of its name. My favorite is a possible reference to the novel “An Antarctic Mystery” by Jules Verne. “The legendary etymology of this piscatorial designation is Janitore, the ‘door-keeper,’ in allusion to St. Peter, who brought a fish said to be of that species, to Jesus at his command.” (St. Peter is said to be keeper of the gates of Heaven, in Spanish it is known as “gallo” hence “door-keeper”.) So while I was able to feast on a fish rooted in religion, it came with all the sacred symbols of food-a-ism…artichokes, ramps, favas, fiddleheads and raspberries. The tithe was a pricey $29. 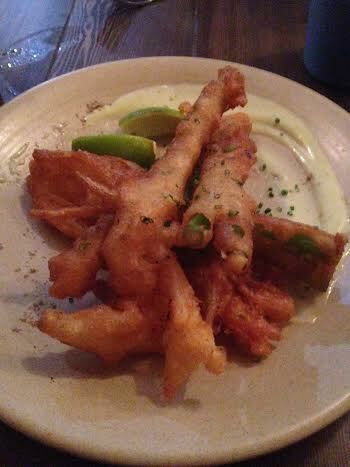 The fish was delicate and moist and keep the overwhelming earthiness of the condiments at bay. The raspberries added some sweet and sour bite and some ruby red colour to the plate. One of the reasons I chose Aziza was the reputation of multiple James Beard pastry chef nominee Melissa Chou. 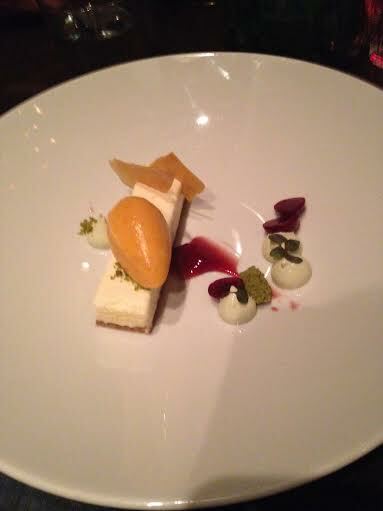 I chose the Vanilla Semifreddo with apricot sorbet, matcha and almond ($10). The crust was like buttery toffee crack. Don’t get me wrong, the rest of the dish was delicious but that crust will stay in my lingual memory for some time to come. 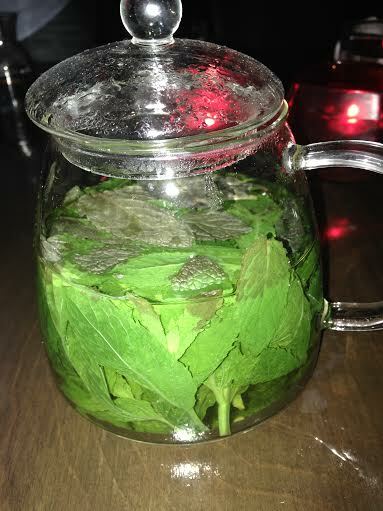 I ended the meal with a delicious spot of mint tea. Let me point out this was not a stagnant tea bag floating around a warm pot of water. 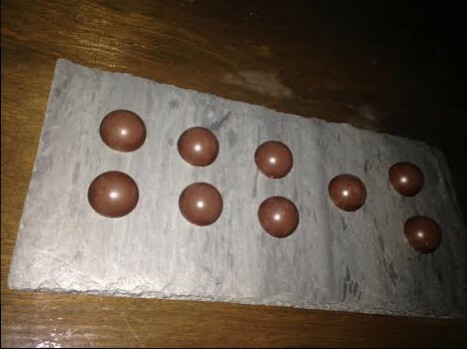 It was a hot, steaming pot of real mint tea which went nicely with dark chocolates served at the end of the meal. Moroccan food is a little mysterious. The flavours are a bit African, a bit middle eastern and a bit European. Most of my experience with this type of food has come from a recipe book and my red Le Creuset tagine, so I was excited to experience it in Michelin star style. Although I can’t verify the authenticity of the use of fiddlehead ferns or ramps in Northwest Africa, the dishes were diverse and delicious. The cocktails were creative and nectarous. There was an irony in eating a fish which is also named after one of Jesus’ disciples in a restaurant whose country of inspiration is 99% Muslim. As for dessert, it definitely rocked the casbah. Much like the 1982 song by the Clash with the same name which calmed Middle-Eastern tension (at least according to the video), I think the crust on the semifreddo alone could extend the ceasefire in the Gaza war. Ok, maybe that’s a stretch, but I’m just a believer that a good meal can fix anything. My Annual Pilgrimage to Richmond Station with an RSV. Despite all the eateries in Toronto, I have to visit Richmond Station at least once a year. In fact, I like to brag about it so I usually bring a RSV (that would be a Richmond Station Virgin) to try things out. On this occasion, it was a lunch visit with a colleague of mine from Alberta who was in town for the weekend. There are a couple of things I’ve concluded about Richmond station. First, I don’t like sitting in the bottom part. It’s a little too congested, you get the constant aggravation of people coming and going and I’d much rather watch the performance in the kitchen versus that of the bar. Second, I always get excited about the chalk board specials which are daily whimsical creations from the creative mind of Carl Heinrich. They have a small but solid menu which regularly changes but always includes oysters and the Stn. Burger. We got there on the heels of the lunch rush so we still could benefit from the $19 prix fixe menu, featuring a lobster bisque as the starter and a braised veal sandwich. I’ve had the bisque here before so I highly recommended it to my lunch mate. 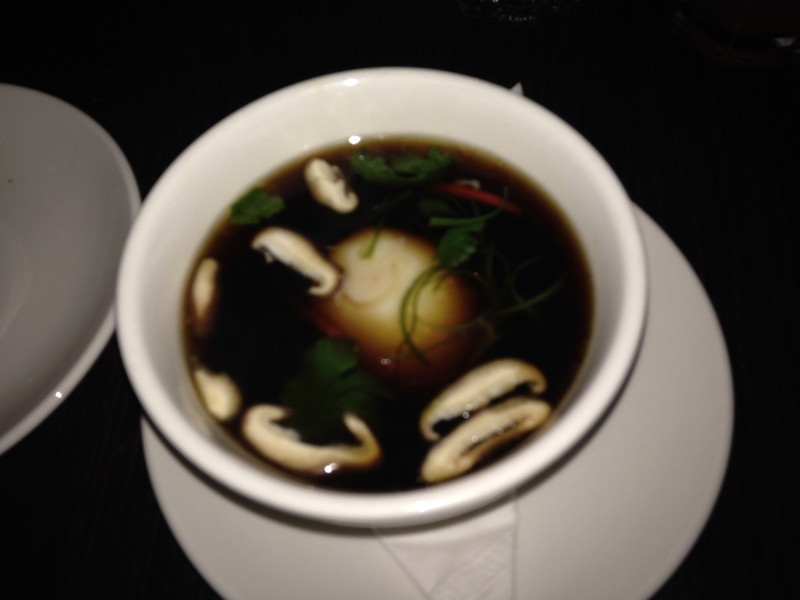 As for myself, I had my eye on the burger and matched his bisque with the mushroom consomme. Served with a soft boiled egg and seasoned with sesame. I might almost suggest it was undersalted but this is coming from a guy whose definition of consomme for 20 years was something that came out of a red and white can. Piercing the egg to release the saltiness of the yolk helped. The stn. burger remains one of Toronto’s best (as well as one of the more expensive). The patty is designed for medium-rare to medium which allows for great moisture and flavour. Without the need to mask the meat with an abundance of toppings, the burger is simply served with aged cheddar and a few other fixings beside a heap of delicious fries and a ramekin of aioli (I’m not an aioli guy so I’ll take the fifth). I don’t get the beet chutney which is served more like a garnish than a palate pleasing partner. 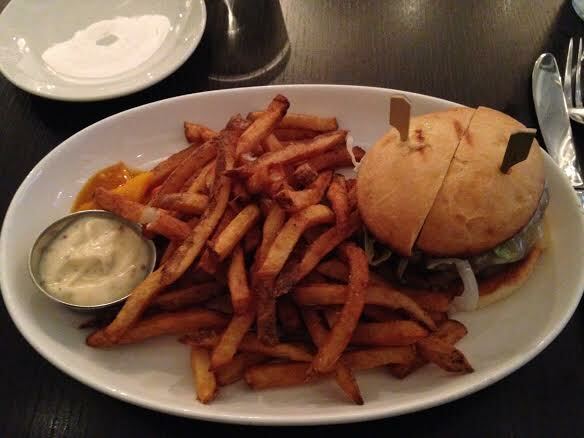 Nonetheless, it’s a delicious burger that remains in the conversation for best in the city. At Richmond station, dessert is not an afterthought. Available as a $5 add-on to the prix fixe menu, it evolves with as much as a cutting edge mentality as the menu itself. Take “movie snacks” for example. 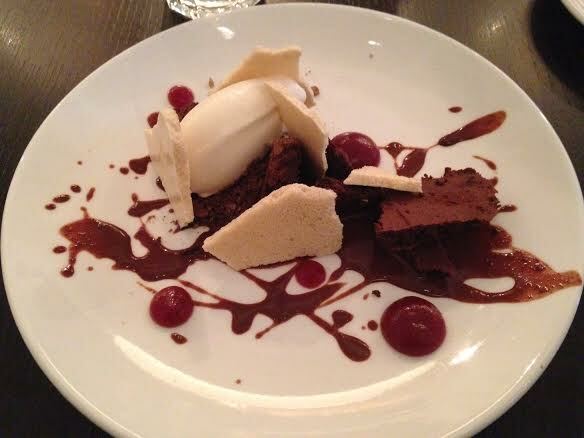 If memory serves, it’s a combination of chocolate cake, almond brittle, cola wafers, popcorn ice cream and twizzler puree (a clever mix of cranberry and Pernod). Smart, stunning and delicious. 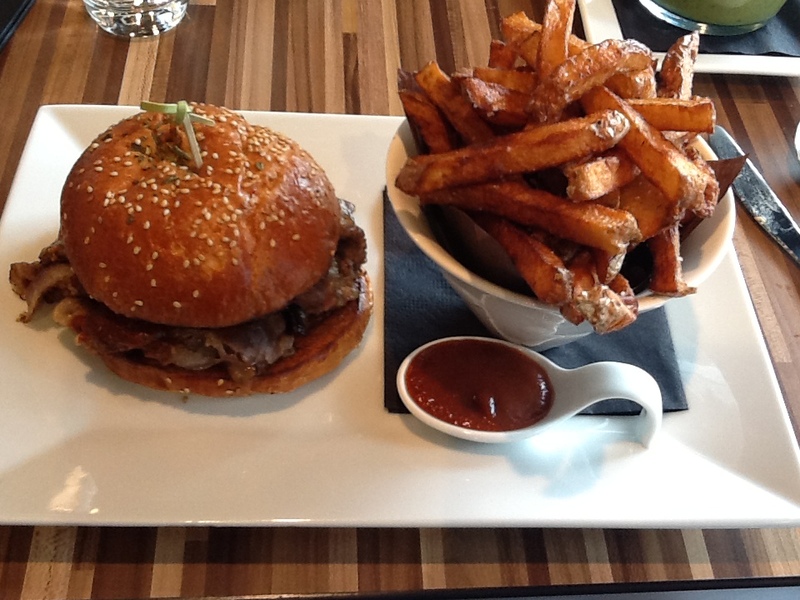 I’ve thoroughly enjoyed Richmond station since it opened shortly after Carl Heinrich won Top Chef Canada 2. The convenient location (unless you’re trying to park), casual environment, great service (including the fact they take reservations) and a small but relevant menu (enhanced by daily inspired chalk board creations) makes for a great dining experience. The biggest issue may be the fact that your favorite dishes disappear and get replaced by a sunchoke, a chestnut or whatever new culinary trend that emerged. That said, I don’t doubt that anything new would be as tasty as it’s predecessors. Don’t take it from me… at time of posting it was number 1 on tripadvisor. I guess I’m not the only one deflowering RSVs.